Rational Angle: "Permenently High Home Prices?" The trouble with this argument is that it’s an argument for rising rents as well as rising prices — and if you believe the BLS data, that just hasn’t happened nationally. 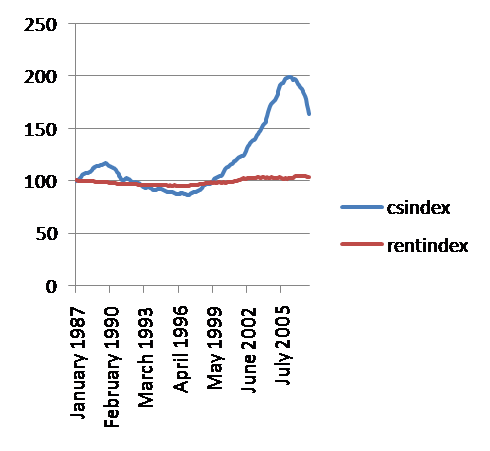 Below are the Case-Shiller home price index and the BLS index of “rent of primary residence”, both adjusted for overall CPI and expressed as indexes with Jan. 1987=100. Bottom line: rents have hardly risen at all in real terms. Now, maybe the BLS is wrong. But for what it’s worth, the data say that essentially all the rise in real home prices came from a rise in the price-rent ratio, which suggests that things will go right back to where they were. I would add one other thing: that real risk-free yields have also fallen over that period, and that should also be accounted for.